Parmesan Shrimp or Scallops. On their own or with a Surf 'n Turf dinner! 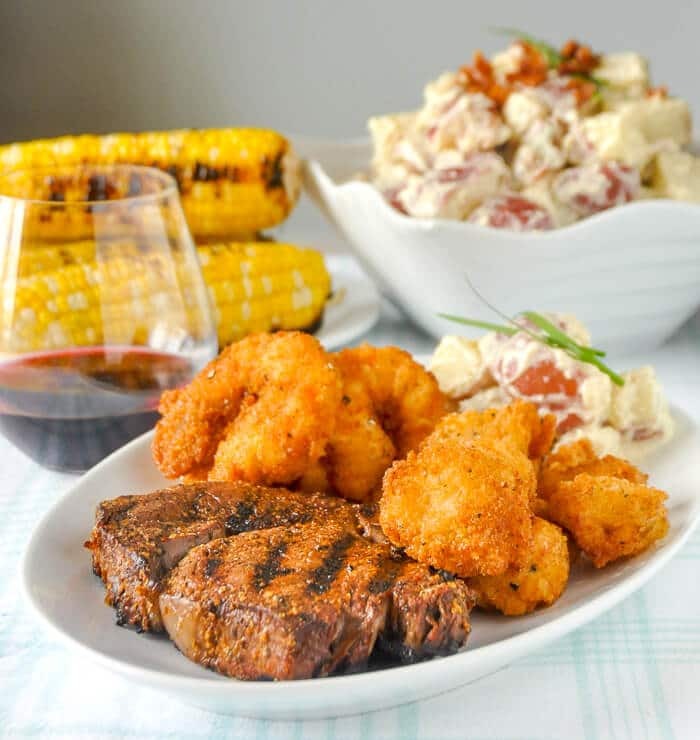 Parmesan Shrimp or Scallops or both to complete an incredibly delicious steak and seafood Surf ‘n Turf dinner. They are delicious dipped in our homemade Caesar Salad Dressing. 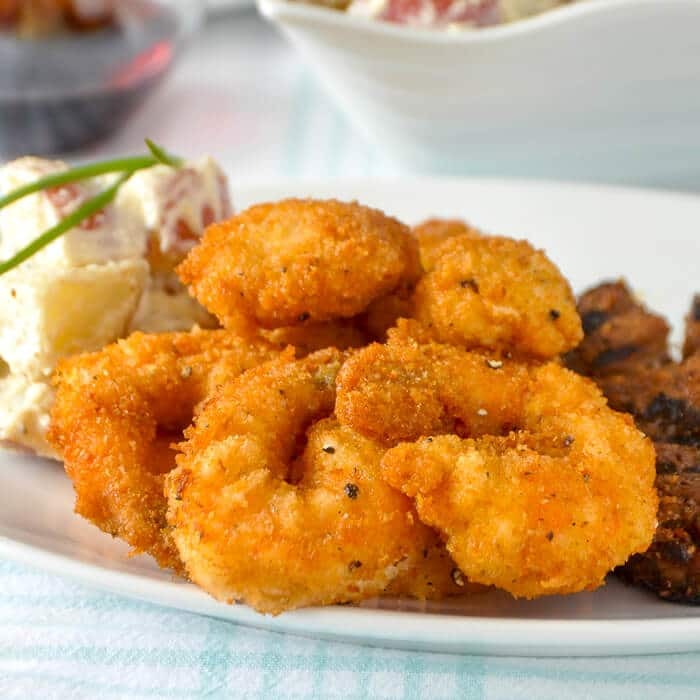 Each year on Father’s Day weekend, I like to treat myself to a great Surf and Turf meal which I like to make at home and this year these Parmesan Shrimp and Scallops are on the menu. Don’t worry, I’ll be treated to brunch out this weekend too so I won’t be cooking all weekend long. In the past few weeks I have sort of been planning a menu for this yearly indulgent meal. Some of the most recent posts on Rock Recipes would make fine additions to a Fathers Day barbecue. For a starter, you could make our recent Southern Fried Chicken Wings with Honey Drizzle. As a side dish either our Caesar Potato Salad or a Classic Caesar Salad would be great followed by some of our Coconut Cream Cheesecake or one of the very popular Homemade Flakies that we featured this week. I’m sure any Dad would be very pleased to have any or all of that on the menu! The steak in this photo is a classic Rib-Eye, cut from the centre of prime rib of beef, my favourite cut by a country mile. This time I covered it liberally in another recent hit on RockRecipes, my Homemade Montreal Steak Spice, which has all the flavour and far less salt than commercial brands. I let the steak stand in the fridge covered in the spice blend for a few hours to let the flavour penetrate well and it was absolutely delicious! Remember to never grill your steak straight out of the fridge. It is much easier to cook it to the perfect level of doneness you prefer if it is near room temperature before cooking. I take mine out about 45 minutes before cooking but a half hour is a bare minimum for me. This varies depending upon the thickness of the steaks of course. Very thick steaks I allow an hour to come up to room temperature. The steaks are, of course ,well wrapped during this time. Happy Fathers Day to all the dads out there and to those who are also much missed. Like this Parmesan Shrimp recipe? You’ll find many more ideas in our BBQ & Grilling section and even more great dishes in our Fish & Seafood Category. 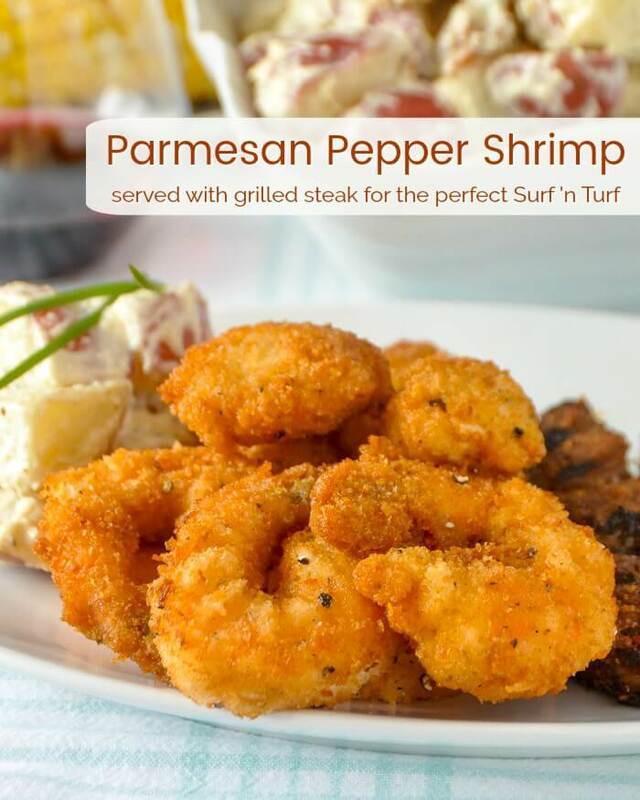 Parmesan Shrimp or Scallops - or both to complete an incredibly delicious steak and seafood Surf 'n Turf dinner. 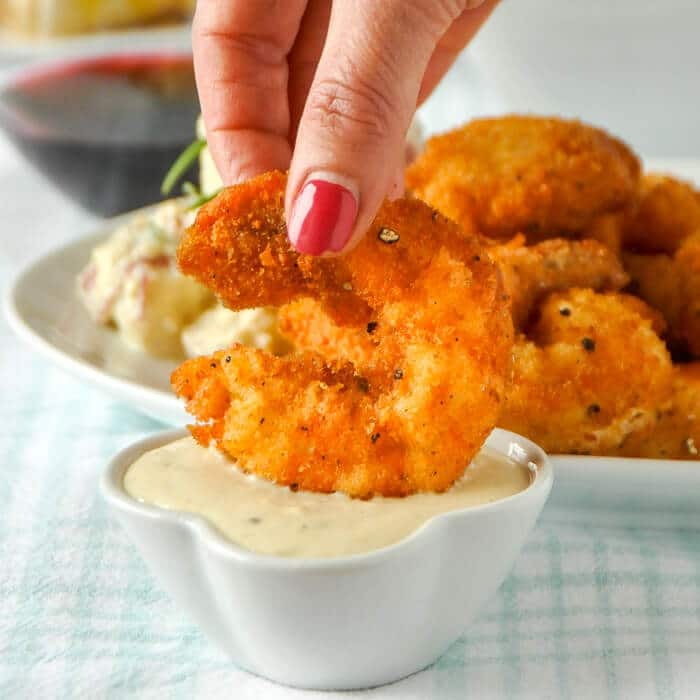 They are delicious dipped in our homemade Caesar Salad Dressing. Preheat the canola oil in a deep fryer or in a cast iron dutch oven or pan to 350 degrees F.
Mix together the bread crumbs, parmesan cheese and black pepper well. I do this in my food processor to ensure that the cheese is a consistent size with the bread crumbs. It is best to have your shrimp and/or scallops near room temperature before cooking so that they do not cool down the oil too much. This is often the cause of deep fried items absorbing too much oil and not being perfectly crispy. Season the shrimp and scallops with salt and pepper and then roll them in the plain flour to coat them. 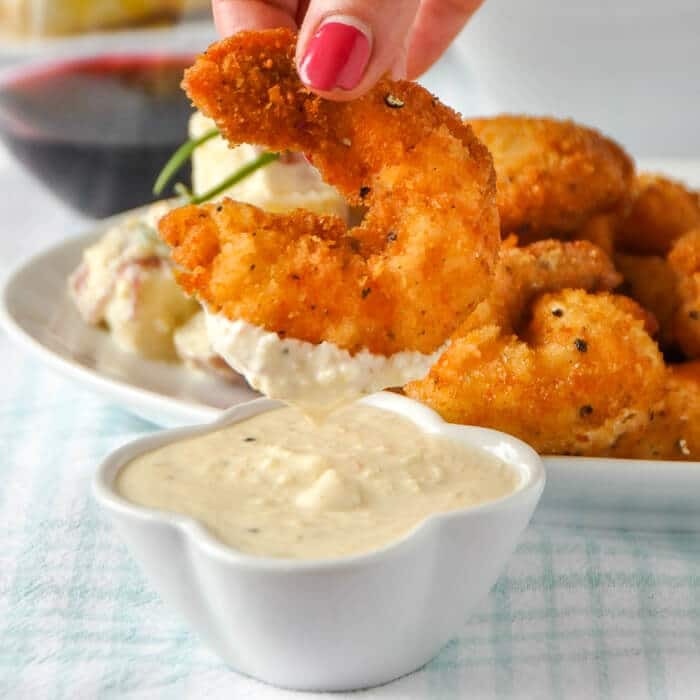 Next, whisk together the egg and water to make an egg wash.
One at a time dip the flour coated shrimp and scallops into the egg wash and then into the parmesan and bread crumb coating. Press them firmly into the crumb coating on all sides to get a good even coating. Lay them on a parchment lined baking sheet while you complete coating the rest of the seafood. Drop them into the preheated fryer and cook for only about 5 minutes or until they are evenly golden brown. Serve with Caesar Salad dressing as a dip if you like.